I am back after taking a mini vacation up to a beautiful Bed & Breakfast in New Hampshire. Right on Lake Winnisquam. Sometimes you just need to get away from it all… Ahhh! It’s just the best to have someone make a lavish breakfast for you, and there were always freshly baked cookies. It’s like visiting your favorite Grandma, without having to help out in the kitchen 🙂 More on that soon! But before leaving, I had to make a few things that I could bring, for snacks and since I really did not know about the whole cookie thing they had going until we got there… And besides we were going to be on the road for six or seven hours. 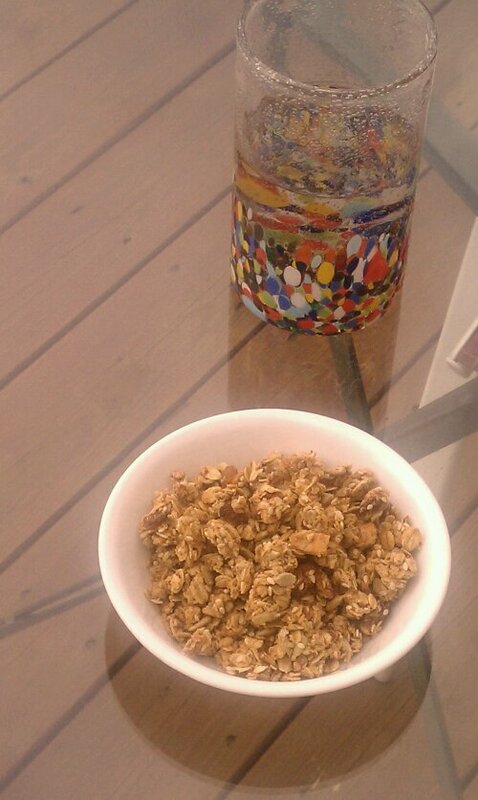 So I decided on another granola. 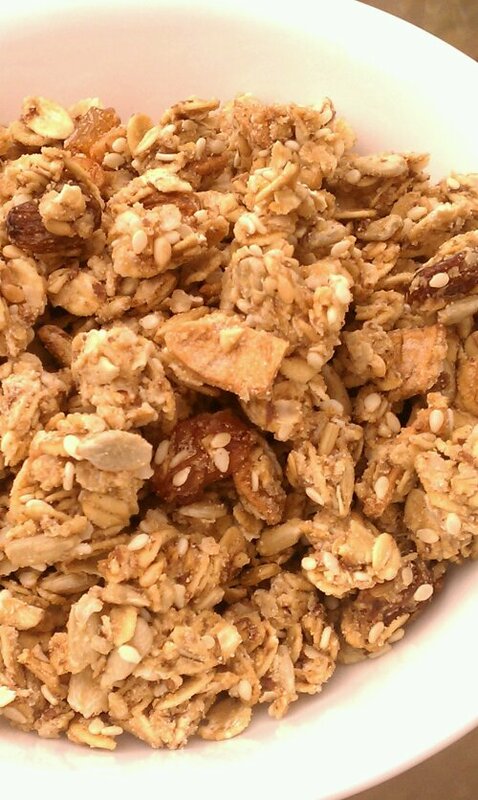 Thanks to Heidi over at LightlyCrunchy who made this fantastic Apple Cranberry Granola, I was inspired to add the apple rings to my granola instead of just indiscriminately munching on them. 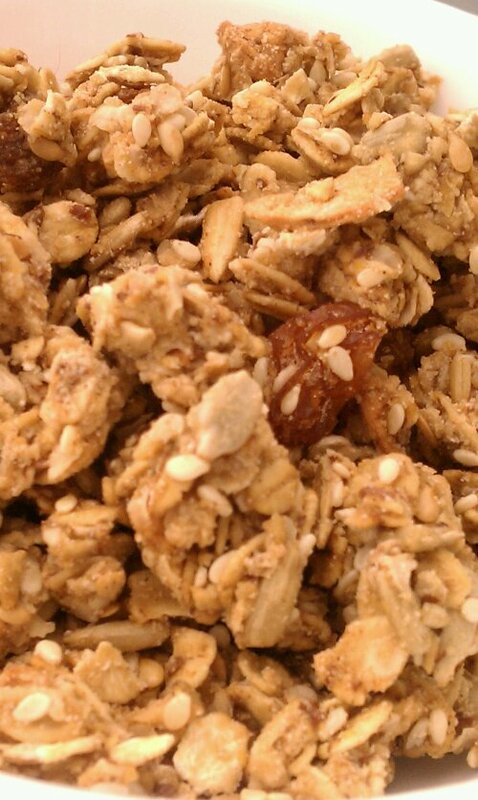 I had never thought of using up my dried apple rings in a granola, what an ingenious idea! I go through phases, I find something, love it eat a whole bunch and then, not sure, but forget about it for a while? or get kind of tired of the taste? Anyhow I found myself with a good size bag of dried apple rings living in my cupboard, so now it can find its way into my breakfast and snacks 🙂 Delicious! The only thing I will work on for next time? Portability. 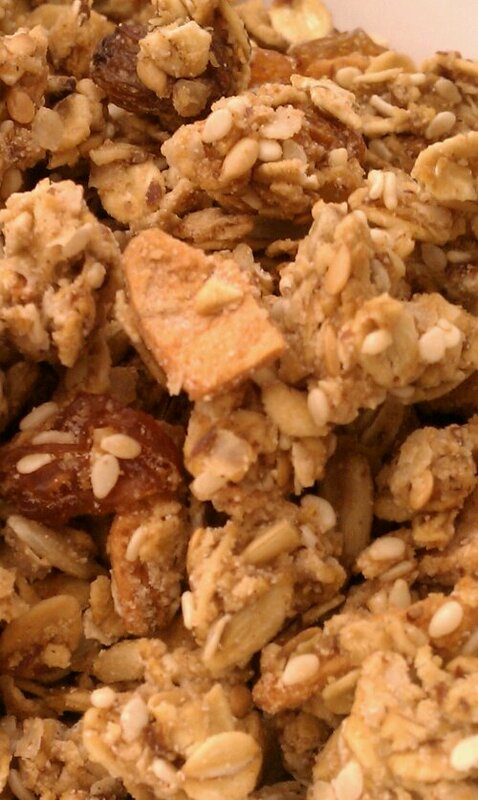 Try eating granola while in the car… Not easy! In a separate bowl, mix the wet ingredients: rice syrup, honey/agave, coconut oil and the flax meal mixed with the water. Add the wet ingredients to the oat mixture, stir well until evenly distributed, spread on a lined baking sheet and bake for 20 minutes. Stir, bake 10 minutes, stir again and bake for an additional 10 minutes. Wendy, Thanks so much, our little trip was awesome. I so wanna go back again. I will try and write a little about the place soon, it’s soooo beautiful and peaceful and there is so much you could do, or you can just sit and do nothing! 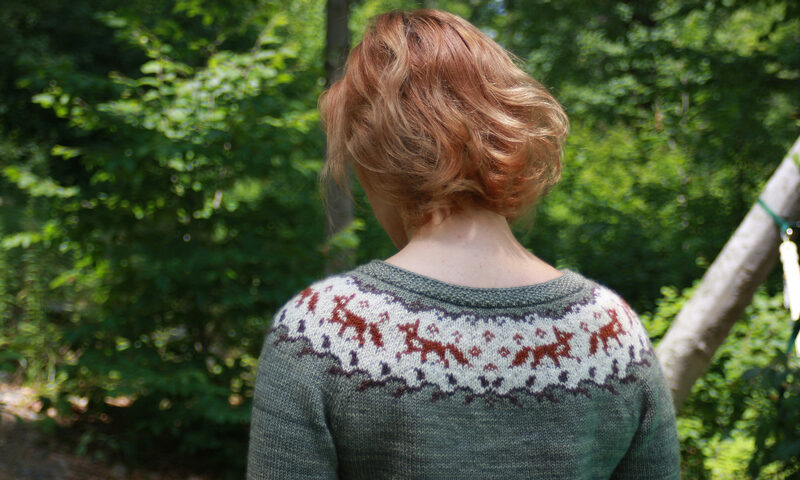 I like the way yours clumps nicely. I must be stirring mine too much. Glad you like the apple idea! Heidi, the dried apples are awesome! They get kinda crispy, almost like the freeze dried ones from the store that are a million dollars per pound! Love it! Maybe if let it sit a little before putting it on a baking sheet it will stick together more? I totally believe the secret to clumps is the rice flour and flax meal.